It’s an odd detail how out of step video calls links are with today’s emphasis on branding, design, and customer engagement. Whether you’re a business always working to be both buttoned up and welcoming to customers, or you’re developing your own personal brand, your brand and design matter. “Branding” sometimes gets confused with big (or inauthentic) spending. In 2016 companies in the US alone spent $600 billion on branding, per the Association of National Advertisers. It’s knowing who you are, and infusing your work with your values. Our own customers enact their mission every day. They’re startups, SMBs, creatives, remotes, and customer-focused teams who bring a sense of purpose to their work. They’re interested in building great products, and providing a great experience for their customers. They’re attentive to the details, whether in responding to customers or in executing their product vision. They go out of their way, for even small details to truly reflect who they are. Our team at Daily.co makes a new kind of video calling for SMBs. When we relaunched our free service last year, we looked at why our users do video calls, and how we could give them the best possible tool. One key aspect of video calls, for SMBs and startups, is the personal connection. On every call, you’re connecting and representing yourself and your work. For example, if you’re talking with a prospective customer, you get the chance to make your own case on a video call. Doesn’t matter how much a competitor is spending on advertising. The meeting can be your chance to close the deal. It’s odd then, that video calling links can be so impersonal. Often off-brand, and regularly clunky. Simply, when guests look at their calendar, at a link you send them, your links should reflect you. You should be able to customize your link, to represent you. No odd numbers (unless you specify that!). 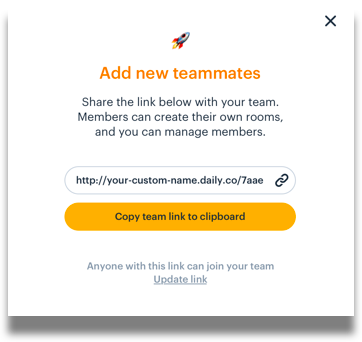 If you’re on a team, teammates should be able to customize links, on the company brand. No sticking teammates with numerical strings. We started with the idea that your Daily.co video calling links are fully customized. Both subdomain and room. So you’re on-brand. Your links are more personal and friendly. 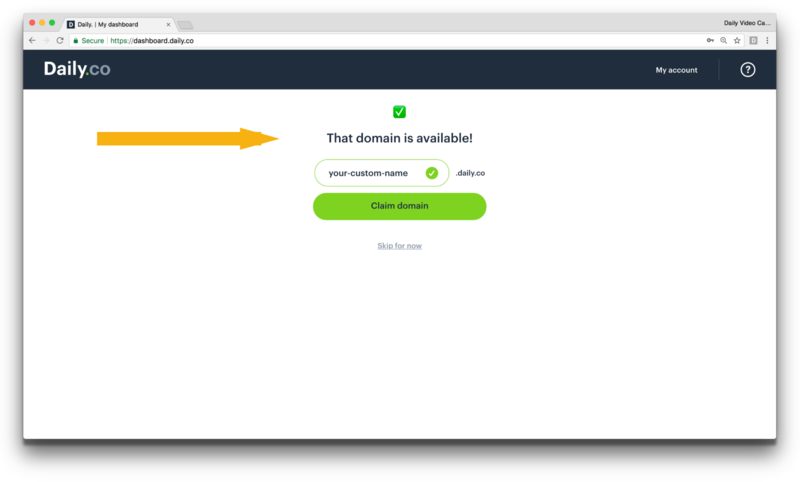 For teams, colleagues can have their own personalized links on the company subdomain. For more background: At Daily.co, our goal is to make video calling an easier, better experience. (Our background in video conferencing goes back many years, designing new tools for Fortune 100 companies.) Using new tech and emphasizing design, we’ve built much simpler, more personal calls. When we started designing customization into Daily.co, our software already was no download. It was easy and fast to click and start a call, with no downloads or guest accounts required. But we felt invites weren’t just about fast links. We wanted Daily.co to tap into that key strength of video calling, of a personal connection. Too expensive is pretty obvious. We also didn’t want users to have to download or install anything. 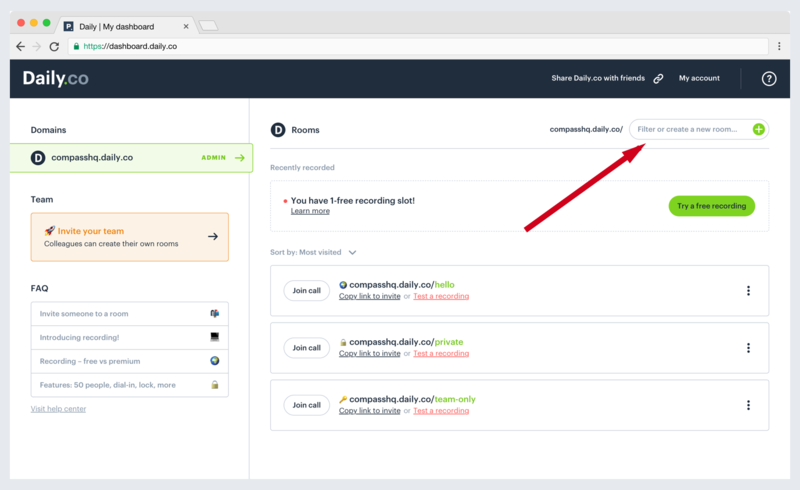 Not only do you just click to join calls in Daily.co, you also can create and customize links in seconds. There’s no puzzling software. Finally, we wanted to provide a solution that grows with our users. As neat as one personal URL is, that's not flexible, especially in a team setting. Many companies brand their subdomain for video calls. As important as that company branding is, so is supporting the work of everyone on the team. It’s frustrating to have to share one company link, too. Teammates should get their own custom rooms. No random meeting strings, and no more sharing links. For example, the design lead at an SF startup has his own meeting room on the team URL, which he uses to record video call interviews with customers for feedback, https://your-team.daily.co/design. Go to Daily.co and sign up with any email, or your Google login. In your dashboard, simply add and customize a meeting room link. Simply send your team link, to invite colleagues to your team. Authorized teammates then can create meeting rooms on the URL. 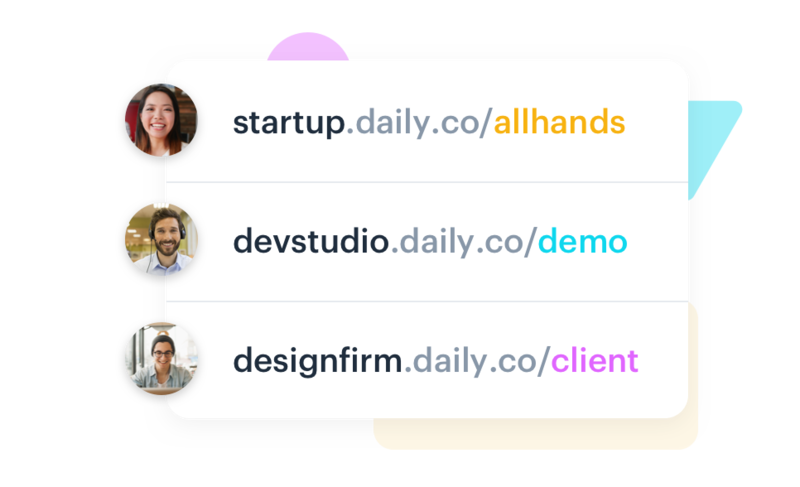 What we’re excited to support, with Daily.co personalization, is a tool that helps you represent yourself, and your work, more effectively. What we aim for is making your calls better, down to the details. Cheers, and here’s to simpler, more personal video calls!